Many people claim to be a “lifetime learners,” and with good reason. Scientists have warned that you need to keep your brain active if you want to avoid mental decay. But some people seem to learn easier and faster than others. These smart people often show creativity and innovation, and quickly pick up new skills on their own time. Learning should be easy to do since we all go through years of schooling training on how to do it. But beyond basic acquisition of knowledge, there is a real art to intensive learning. For deep learning you have to find the time and energy for knowledge and skills building. Really successful learners know the trick is to make the process itself as energizing and efficient as possible. Here’s how they do it. 1. Imagine the outcome.Learning for learning sake is fine for academics or people with lots of time on their hands, but as a busy achiever your learning needs to have purpose. Understanding the need will help you assess how much and how fast you need to learn something. When you start out to learn a new skill set or master new knowledge, envision what you will do with it. Get a very clear mental picture of how it will change the way you work and live. Taking a language class? See yourself conversing with a new client in a foreign country. Training on new software? Picture the problem you’ll solve with it and how it will streamline activity. Successful learners identify the objective at the start, and create a strong, emotionally compelling vision of what will happen when they reach that objective. 2. Think of text as a starting point. Most people remember highlighting dozens of textbooks in high school and college. And how the words started to blur as the brain was swimming in so much stuff. If the material you’re learning has a text component, think of it as just one of many places to store that information. The best learners start with the text, and then move on. They create additional opportunities for experiential learning. They might sit and dialogue with an expert or discuss it with other learners over coffee. They watch others or participate in applying the concepts in practical settings. They know the book is just one place where the information “lives,” and they seek it out in other environments. The more they see those ideas or skills at work in the outside world, the more exciting the material becomes. Then going back to the text doesn’t seem like such a chore. 3. Learn in your language. Every brain has a preferred method for receiving information. Some like to see it sketched out on a whiteboard, others like to hear it out loud, and others want to be on their feet tinkering with it in a practical way. Figure out what method engages your mind, and translate the material to that. If you’re visual, make charts and find YouTube tutorials. If you’re auditory, find lecture recordings, read it out loud to yourself, and discuss it with someone else. If you’re tactile, act it out, or build a model, or use a computer simulation. Successful learners are very self aware about their own learning needs and actively communicate them to others so they get exactly what is necessary to achieve. 4. 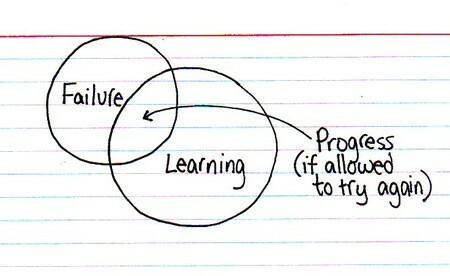 Make failure fun. There is only so much you can learn from being successful at a task from the beginning. The real learning comes from testing and pushing the boundaries. Successful learners stretch the limits and often fail willingly to understand how things work, and of course how they don’t. Any time you take on something really challenging and unfamiliar, you’re going to stumble and fall. No one likes to look foolish, and you may be disinclined to stretch to avoid embarrassment and blows to the ego. The more frustrated and discouraged you get, the more you may want to give up. But if you look for the humor in each letdown, share funny stories with friends and family, and laugh it off, you will be much more willing to keep trying. Ultimately it’s the act of overcoming those failures that will instill greater learning for the long haul. 5. Make accountability exhilarating. People work harder when they are accountable to others for their performance. Most will study harder if a test is on the horizon. Many practice more if there’s a recital in two weeks. Successful learners make themselves accountable for learning through deadlines and measurement. The challenge is that those benchmarks, even though they are motivating, often fill minds with dread. Use the nervousness and adrenaline to your advantage. Create opportunities to display your new skills or knowledge so you can drive toward the finish line. If this makes you overly tense, make sure there are friends to support your efforts along the way. It will make the celebration of success and learning that much sweeter.